The maximum temperature on Saturday was 34.0ºC (93.2 ºF) and the minimum 24.2ºC (75.6ºF). The maximum relative humidity was 90 per cent and the minimum 58 per cent. Rainfall: Rain or thundershowers have occurred at a few places in Haryana, Punjab and east Uttar Pradesh and at isolated places in Himachal Pradesh, Jammu and Kashmir and west Uttar Pradesh. Weather was mainly dry in the rest of the region. The chief amounts of rainfall in cm. are: Haryana: Kaithal 3, Guhla and Panipat 2 each and Delhi Ridge and Pehowa 1 each, Punjab: Raya 3, Nakodar 2 and Adampur 1, East Uttar Pradesh: Kakrahi 24, Bansi 10, Katerniaghat 7, Ballia 6, Etawah 5, Kalpi 4, Turtipur and Varanasi City 2 each Basti, Chillaghat, Ghazipur and Jaunpur 1 each and West Uttar Pradesh: Hindon 3 and Agra 2. 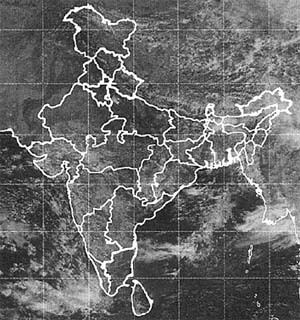 Forecast valid until the morning of August 27: Rain or thundershowers are likely at a few places in Himachal Pradesh, Jammu and Kashmir, Punjab, east Uttar Pradesh and Uttaranchal and at isolated places in the rest of the region. Farmers weather bulletin for Delhi: Forecast valid until the morning of August 27: Light rain will occur at a few places.